One of New Zealand’s longest-running pioneering business success stories, Gallagher Power Fence Systems Limited, has announced plans to expand operations in Kenya at Tatu City. Gallagher will build 24 warehouses on four-acres at Tatu Industrial Park, the leading industrial area with Special Economic Zone status in East Africa. The warehouses will be used for storage of security products and for lease. Construction will commence in September 2017 and create approximately 100 jobs as part of the multimillion dollar investment. 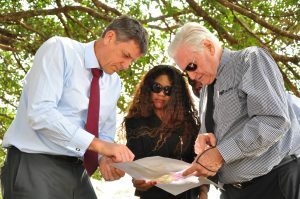 Whilst visiting Tatu City, Sir William Gallagher, Chairperson and CEO of the company, said that the move was a strategic step in Gallagher’s growth and expansion plans in the region. “Over the last 18 years, we have experienced immense support from various partners and customers in Kenya. We are proud to be playing a role in creating employment opportunities, and we aim to reach a wider clientele through the facilities that we will be setting up here at Tatu City,” he said. Gallagher is also in the process of building an electric security fence on the boundary of Tatu City. The fence will will be equipped with CCTV cameras, floodlights and access control at entry and exit points, all monitored in a dedicated control room by Tatu City’s security team. Tatu City’s Special Economic Zone status provides reduced corporate taxes, tax-free dividends, customs duty exemption, profit and capital repatriation, as well as enhanced industrial and intellectual property rights, among other benefits. Companies building at Tatu Industrial Park include Chandaria Industries, Africa Logsitics Properties, Dormans, Unilever, Kim-Fay and Maxam. Tatu Industrial Park comprises of 457 acres of serviced land suitable for non-polluting light industrial, assembly and warehouse and logistic uses.